In a small blender. Blend all the paste ingredients together until you have a smooth consistency. Add the paste to a saucepan and cook for a few minutes on a low heat until you start to smell the aromas, stirring frequently. Add the chicken stock and stir until everything is combined. Add the salt, fish sauce, half of the lime and coconut milk and bring to a gentle boil. Turn down the heat and let simmer while you chop the vegetables. Slice the carrots and add these to your broth. Keep simmering for about 15 minutes. Griddle the baby corn until they start to get a bit of colour. In the last 5 minutes add the chicken, pak choi and sugar snap peas then give everything a good stir. 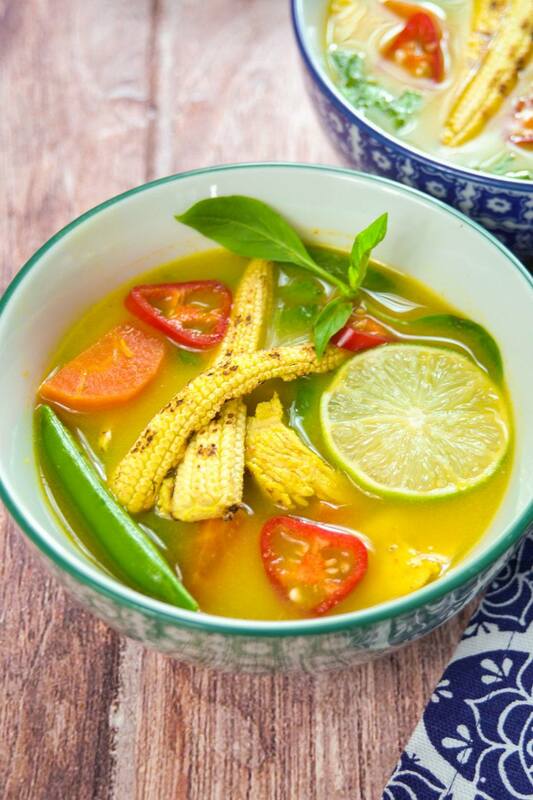 Serve in a bowl and garnish with the baby corn, sliced red chillies and a wedge of lime. Enjoy!